Patrick Roy, Wayne Gretzky, Jaromir Jagr, Mario Lemieux, Ken Dryden, Steve Yzerman. In their prime, they were all Stanley Cup champions, on more than one occasion. Yet none of them came close to winning the Stanley Cup as often as Red Kelly did. The NHL Hall of Famer is the only player to play for two teams of the nine recognized dynasties by the NHL. As part of the Red Wings of the 1950s and the Toronto Maple Leafs of the 1960s, Kelly already secured a legacy in the annals of hockey lore. When I was a teenager, (circa 1991) and entering my second love affair with playing and watching hockey, I bought Red Kelly biography at a church bazaar. Published in 1971, it was already an antique. But for me and my hockey curiosity at the time, all I needed to transport myself to a time I could never have imagined. Over the next few years, other players from that era crept into my psyche. Something about the mid-1950s and early 1960s NHL appealed to me on a visceral level — the photographs and the descriptions used to convey the absolute hatred some of these teams had for one another during the playoffs is second to none. For example, Detroit and Montreal in the 1950s essentially owned the Stanley Cup; the only other team to win a cup that decade was Toronto in 1951. These rivalries were legit, as teams would face each other dozens of times annually, both in regular season play and during the NHL Stanley Cup Playoffs. That it took until 2016 for the authorized Red Kelly to see publication speaks perhaps of Kelly’s understated nature. While never perceived as glamorous as the flashy stars he played alongside (Mr. Hockey Gordie Howe of Detroit, or “Big M” Frank Mahovlich of Toronto), Kelly was a linchpin of every squad he played for — a player coaches, fans, and coworkers could rely on. 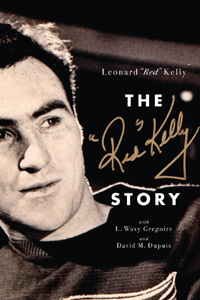 Co-written by L. Waxy Gregoire and David M. Dupuis, The Red Kelly Story is an action-packed hockey memoir, but also the story of a family man who loves his wife (who he met in 1952), an Olympic skating champion named Andra McLaughlin — who, as a teenager, played hockey as a member of the Cheyenne Mountain Indians hockey team. Their courtship is right out of a 1950s period piece, with soda pop, visits with moms in farmhouses, and being described as “a fine young man” by her friends. The most enticing bits of The Red Kelly Story are those thrilling retellings of Stanley Cup Final action, when key goals were needed to defeat teams such as The Montreal Canadiens, which would have pitted arguably the two greatest goaltenders of all time: Terry Sawchuck for Detroit, and Jacques Plante for Montreal. Kelly’s respect for his rivals was equaled with his passion for winning. In the chapter called “Toronto Metamorphosis,” Kelly describes the stressful month in which he refused a trade to the New York Rangers and announced his retirement, only to be lured to Toronto to play for the Leafs as the missing piece in a puzzle that coach Punk Imlach had to beat the Canadiens. This is where Red Kelly came in — Imlach felt he was key to handle the Canadiens big center, Jean Beliveau. As a coach later in his NHL career, Kelly faced possibly even greater pressure than anything in his 8 Stanley Cup Final wins — especially in Toronto, possibly the toughest hockey town to coach in. The section outlining the conflict he faced as the Leafs head coach is rendered with honest emotion, but also told with multi-faceted sources, archival material, personal letters and firsthand accounts. It’s more authentic than well-produced sports news spot cover a night of hockey drama. While every generation can lay claim to witnessing the golden era of hockey, the generation Kelly participated in gave hockey fans some of the most spirited rivalries in an era when the sport was evolving into television in addition to radio, giving way to the modern era, international stages, high definition cable telecasts, slick video games and multi-million dollar contracts. The quiet memories captured in the minds of those who lived the game so long ago comes alive The Red Kelly Story complimenting his storied NHL career and lasting impression he’s made to his peers and loved ones.